Apple fans that like to stay on top of the company's latest devices are now spoiled for choice, as Apple CEO Tim Cook took to the stage at Apple Park's Steve Jobs Theater today to unveil three all-new iPhone models: the iPhone 8, the iPhone 8 Plus, and the iPhone X. And while these smartphones are similar in their use of iOS 11 and Apple's new A11 chip, they differ in key areas like expanded features and basic functionality, and users looking to pick up a new iPhone will want to know the differences. Fortunately, we're here to help. 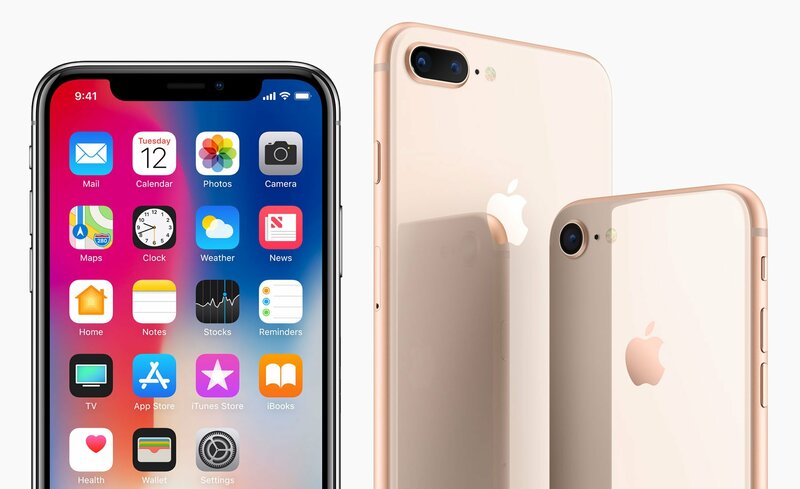 Continue reading to discover the biggest differences between the iPhone 8 and Apple's new iPhone X and learn about the simple decision prospective buyers will need to make before buying one of the new iPhone models. Although an exciting release in its own right, the iPhone 8 is more of an incremental upgrade over the iPhone 7 than the newly-designed iPhone X. Users already familiar with iPhones and iOS should feel right at home with the iPhone 8 and iPhone 8 Plus models, which feature 4.8" or 5.5" True Tone-enabled displays as well as Apple's six-core A11 processor. Among many of the new additions to the iPhone formula is the inclusion of wireless charging technology. 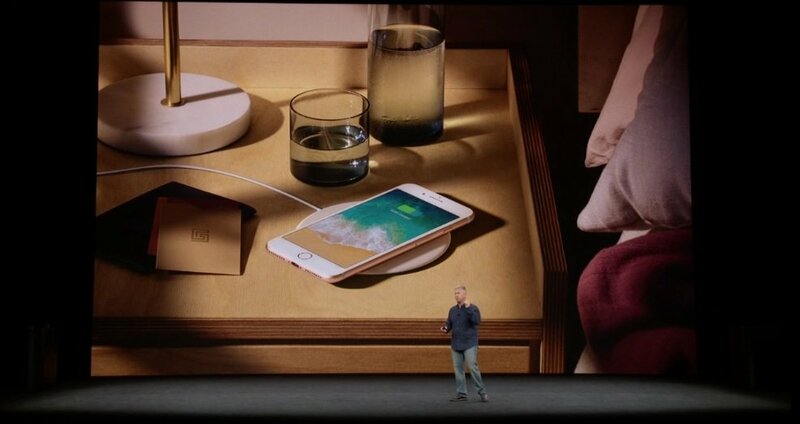 Support for wireless charging is one of the reasons why Apple has ditched the aluminum-backed case of the old iPhone models, and users who have already bought into wireless charging technology will be able to use their Qi standard charging bases to charge an iPhone 8. Also new are the iPhone 8's cameras and sensors. The baseline iPhone 8 model will include a single 12-megapixel rear-facing camera, while the iPhone 8 Plus will include dual 12-megapixel rear-facing cameras. Both options include Apple's new sensors as well as optical image stabilization and iOS 11's "Portrait Lighting" feature. Both models will also feature what Apple executive Phil Schiller calls the "highest quality video capture ever in a smartphone," meaning users will be able to record 4K video at 60 frames per second or 1080p video at a whopping 240 frames per second. Like with the iPhone 7, both of the iPhone 8 models come without a headphone jack; users who want to use traditional wired headphones will have to either buy an adapter or opt for bluetooth-enabled earbuds like Apple's very own AirPods. 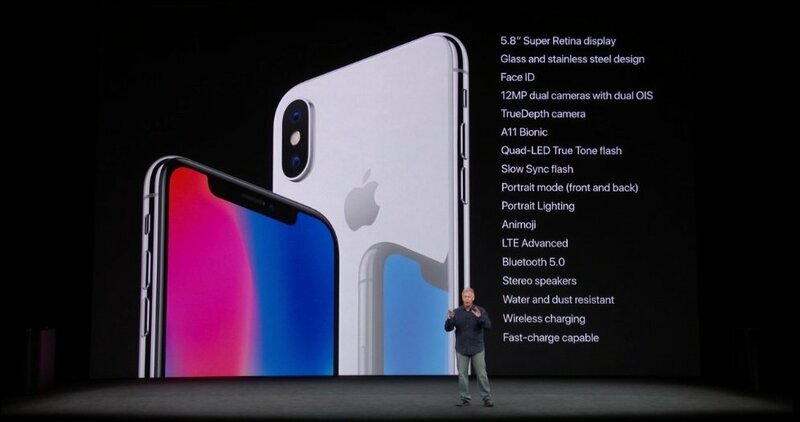 By and large, the iPhone X features many of the same features as the iPhone 8. 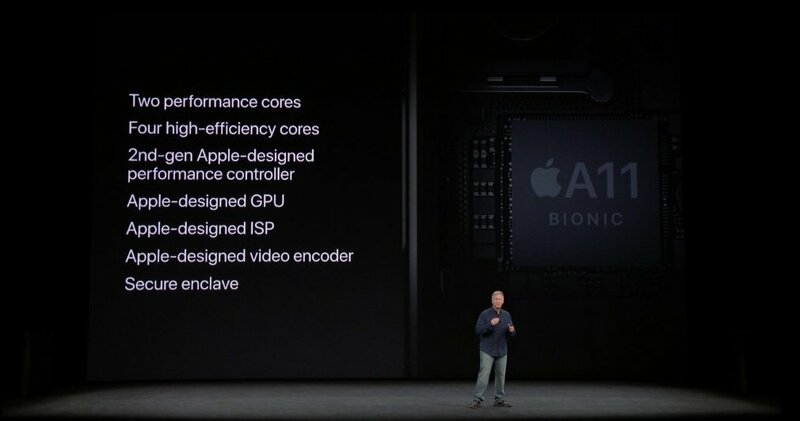 Both devices sport Apple's A11 "Bionic" processor, both will run on iOS 11, both include support for wireless charging, both ship without a headphone jack, and the iPhone X and iPhone 8 Plus share a similar dual-camera setup. It's only beyond these details that the phones start becoming distinct. Firstly, and most obviously, the iPhone X features an edge-to-edge 5.8" OLED display featuring a 2436x1125 resolution, meaning the screen features an incredible pixel density of 458ppi. The new screen is more than just eye candy, though; the edge-to-edge display leaves no room for the traditional Home button, which means the iPhone X simply doesn't have one. Without a Home button, users will have to make use of various gestures in order to navigate the phone. Most are straightforward: accessing the Home screen can be accomplished by swiping up from the bottom of the screen, while swiping down from the top will bring up iOS 11's new Control Center. iPhone X users can access Siri functions by using the phone's side button, while context-based gestures like pausing while sliding menus will be the primary means of multitasking and closing apps running in the background. 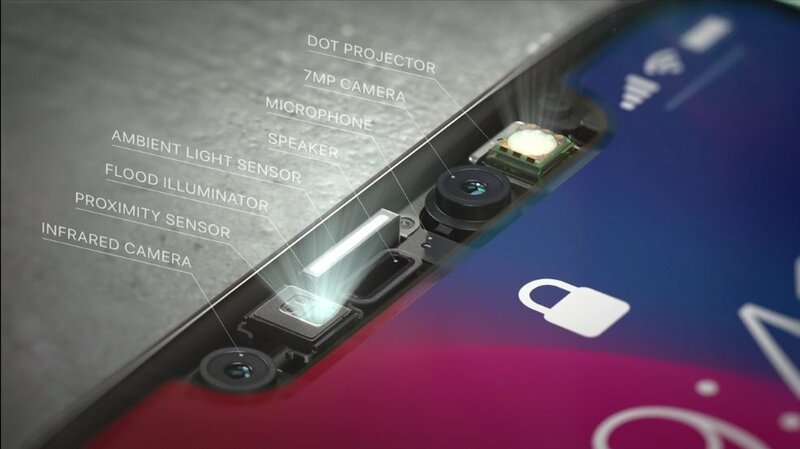 Getting rid of the Home button creates another big change to the usual formula: iPhone X users will likely be unlocking their devices by making use of the phone's Face ID system. This new technology is cutting-edge, and involves creating a 3D map of a user's face and checking that data against information gathered by a serious of infrared dots and images captured through the front-facing camera. This means that unlocking an iPhone X will involve nothing more than simply looking at the screen. Lastly, iPhone X users will be able to make use of Apple's new Animoji, which combine twelve 3D-revamped emoji together with Apple's Face ID technology to create a new way for users to express themselves. While certainly not the biggest feature available on the iPhone X, Animoji is all but guaranteed to become a popular feature sure to appeal to text-savvy users and child-at-heart adults alike. Which iPhone Model Should I Buy? Deciding between Apple's latest iPhone models isn't easy, but the decision can be made more simply by considering how the device will be used as well as why it's desirable to begin with. All of the new devices sport sleek glass-and-metal designs with reasonable water protection, so neither is better or worse for mobile users with active lifestyles. Both also make use of iOS 11, and the operating system's powerful suite of tools means both devices should run the same apps in generally the same manner. However, the iPhone X appeals to a much more specific demographic than the iPhone 8, and that demographic consists of users who like to have the latest and greatest. The iPhone X's edge-to-edge screen is beautiful, but more important than the screen is the device's lack of a Home button. This will make the device less familiar to previous iPhone users and potentially much more confusing to users more familiar with Android. The change was made with productivity and ease of use in mind, however, and users who aren't opposed to change will likely enjoy the iPhone X more than the iPhone 8 models. Beyond that, the iPhone X just has the added "cool" factor: it costs a thousand dollars or more, which is a good $300 dollars over the cost of the baseline iPhone 8, meaning only the most affluent Apple fans will be able to afford one. Beyond that, many of it's biggest features, like Animoji and ARKit support, will be more enjoyable for mobile users who know other iPhone X owners. Like many other Apple products, then, the iPhone X will be the envy-enducing gadget of choice. Fortunately, there really isn't much that the iPhone X can do that the iPhone 8 cannot when it comes to basic functionality: both devices make calls, run apps, play games, take photos, play music, et cetera, and both are sleek, new, and delightfully-chic handsets. Users who want a great all-around phone will be perfectly happy with the iPhone 8 or iPhone 8 Plus; however, those users who crave the absolute latest and greatest tech candy already know they won't be able to settle for anything less than the best Apple has to offer. In that case, the iPhone X can be considered a must-buy.